Unfortunately nowhere is truly undiscovered anymore but Croatia offers many authentic unspoilt and peaceful places to hide away and enjoy the mediterranean for a while. Not Italy, not Greece, not Turkey but a true mediterranean charm of its own. 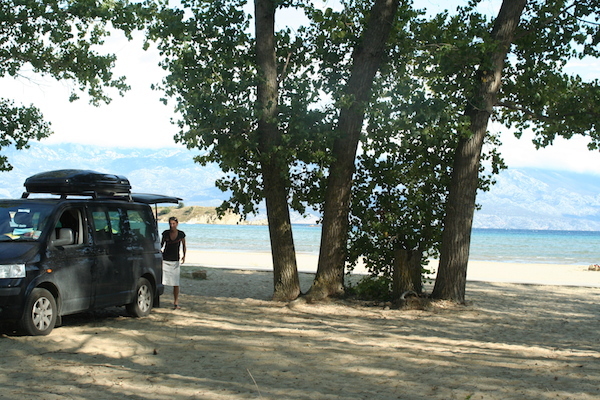 Six years ago when we travelled in Croatia for the first time we fell instantly in love with it. We chose what we hoped would be quieter, unspoilt islands and found that despite many people talking of rapid development and reliance on Tourism, much of the country still moved at its own pace, clinging to a traditional way of life, governed by the seasons, the sea and by the dribble of tourists that ventured there. We visited again last year, unusually for us revisiting some of the places that we have stayed before and also exploring different islands. Mixed emotions; a place is never the same when you go back to it, particularly if you are driven back there by a romantic notion but we were pleasantly surprised that though tourism had made more of a mark (a few more large hotels on the coast as we drove north from Dubrovnik to Peljasac peninsula), the small towns and villages have managed to keep the balance of local life and indulging tourists. So now we are in beautiful Croatia again; arriving from Slovenia this time. 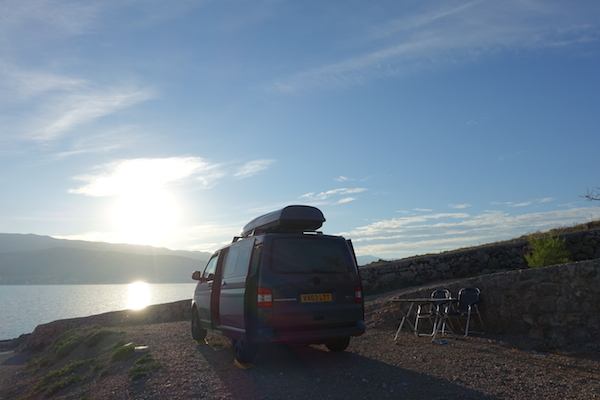 The long drive from Lake Garda in Italy meant we sought an easy stop for the night but did not want to compromise as so many of the fleet of roaming European camper vans seem to do. Otok (island) Krk, with a bridge from the mainland, was the first that promised a campsite and from our six year old map at least, a small town. New roads to the village concerned us a little but we needn’t have been worried. The small town of Silno looking back to the mainland had several restaurants a few quiet bars and a campsite just 500m from town. We’ll be alright here we thought, but our hearts sank as we reached the campsite, row after row of caravans stacked up under the trees, “it will have to do just for tonight”. Tomaslav on reception was very friendly and showed us a map of the site that stretched right down to the sea. “We could park anywhere we liked” he said, what we always want to hear. We trundled through the caravans and the beach opened up to a huge open expanse of empty, pebbly beach next to the sea – hooray! The lottery that is travelling had, this time, thrown us a good end to a tiring day. A beautiful place, our place tonight. Next morning, we thought about staying longer but the desire for sunshine drove us to move further south. 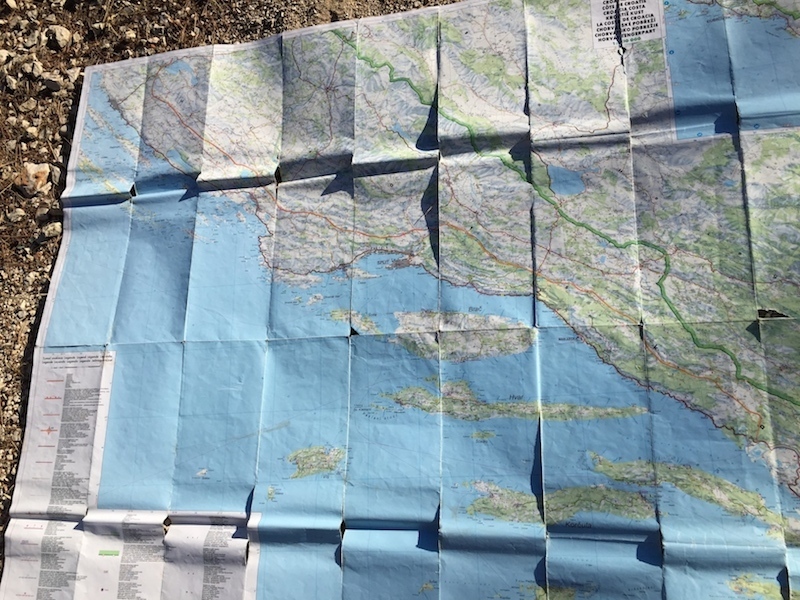 Our ragged map and out of date guidebook (which was always relatively useless – better to confirm the places to avoid rather than those to visit) pointed us in the direction of Hvar island. 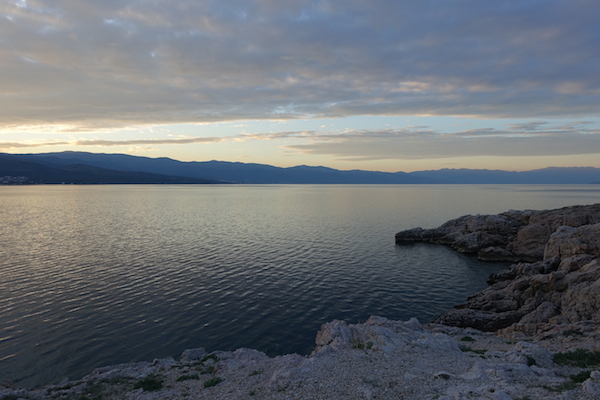 The book warned it was the most beautiful but most developed of the islands but reading between the lines our experience suggested something different, we took our chances and took the ferry from Drvenik. The long windy lane down the length of the island did not show any signs of rapid development, narrow and twisty, with drop offs on either side, it was fun to drive but did cost us a wing mirror when we were kissed by a passing truck. The first few campsites on our old map where nowhere to be seen and thankfully no hotel monstrosities in their place either, just peaceful tumble down villages lazily trying to sell lavender and honey. 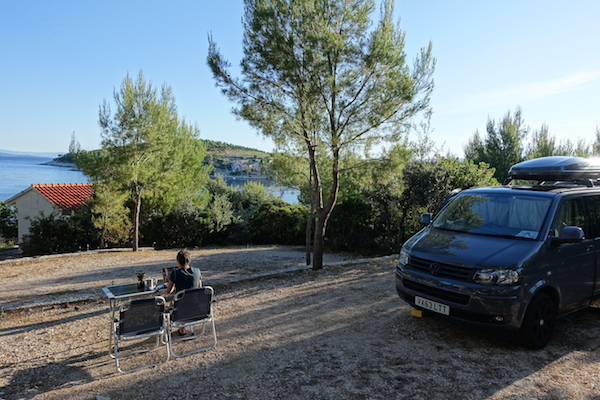 65km later, the campsite at Vira near Hvar was our last option, half full with campers and a few tents nestled in the shady terraces in a sheltered bay looking out to the islands of Brac and Solta, we planned just one night but stayed for three. 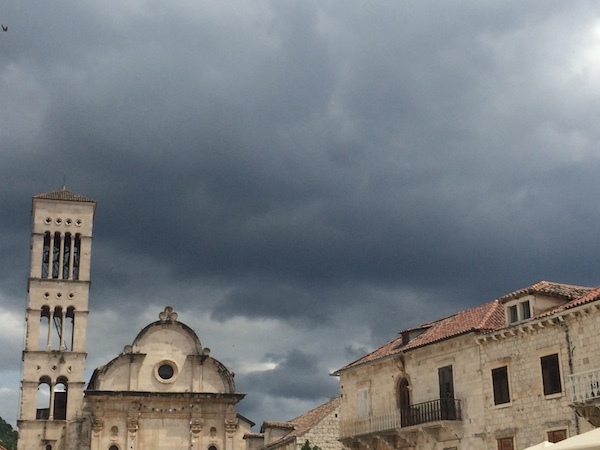 We set off on a flip flop walk into Hvar and were attracted by Panorama after only 20 mins. 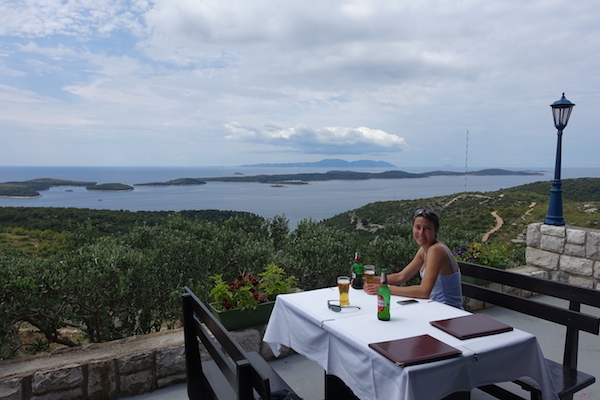 A restaurant on the top of a hill serving a midday beer and grilled calamari, just us, the waiter, the cook and a spectacular view. The end of our walk revealed a beautiful old harbour town slightly jaded by the gaggles of tourists from 18-30 cruise / sail ships that rowdily and amusingly made their way to the beach or the plethora of restaurants with great big menus in 3 or 4 languages and even pictures in some cases. Oh dear! Luckily we had stopped off en route at Panaroma. It didn’t take a lot of wandering to find beauty in the old town and the, not quite undiscovered but quieter, local’s places where we stopped to watch the world go by in the harbour with a glass of wine and sunshine under stormy skies. 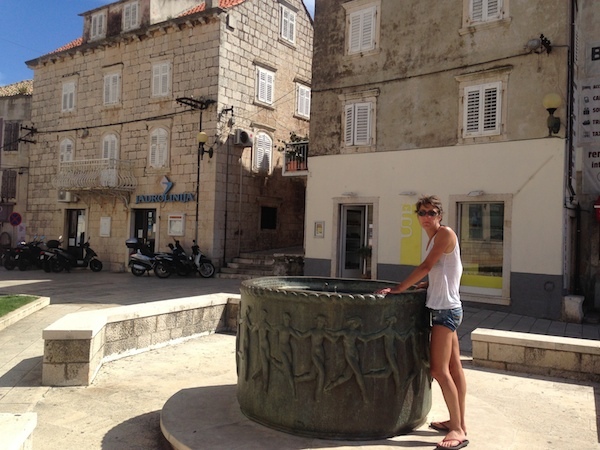 Energised and wanting to explore, next day we went to Stari Grad, the second large harbour town on Hvar island. 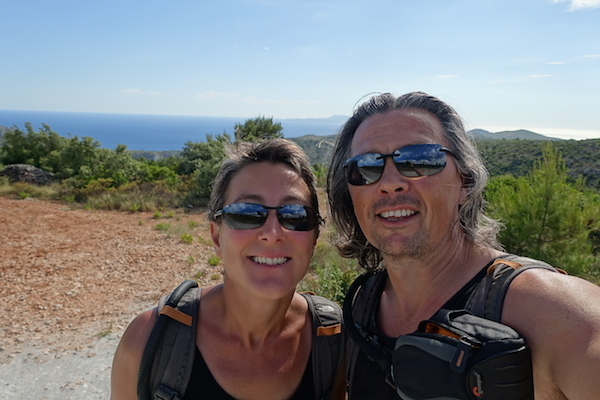 We took the probably rather daft decision to walk to Hvar, bus to Stari Grad and then walk home. 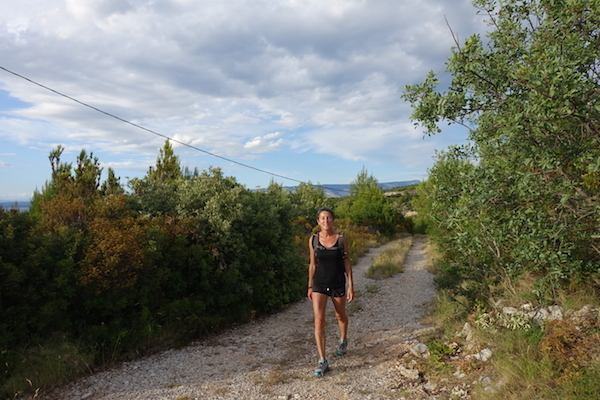 The 30km walk probably would have been a little easier on bikes (as several people did that passed us with their tour guides on the long drag up and over the hill from Stari Grad back to Hvar that afternoon). 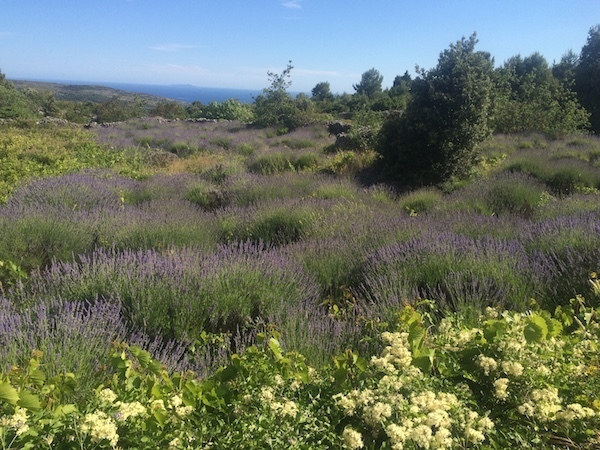 as it meanders through fields of lavender and Olive terraces. A slight detour / ‘long’ cut as we neared home brought us to a Konoba (tavern) Ringo and a wonderful fish dinner in the friendly place. A welcome shelter from the sunshine, from the increasing sea breeze and a little recuperation for our legs before the last few hundred metres back to camp in the bay at Vira. 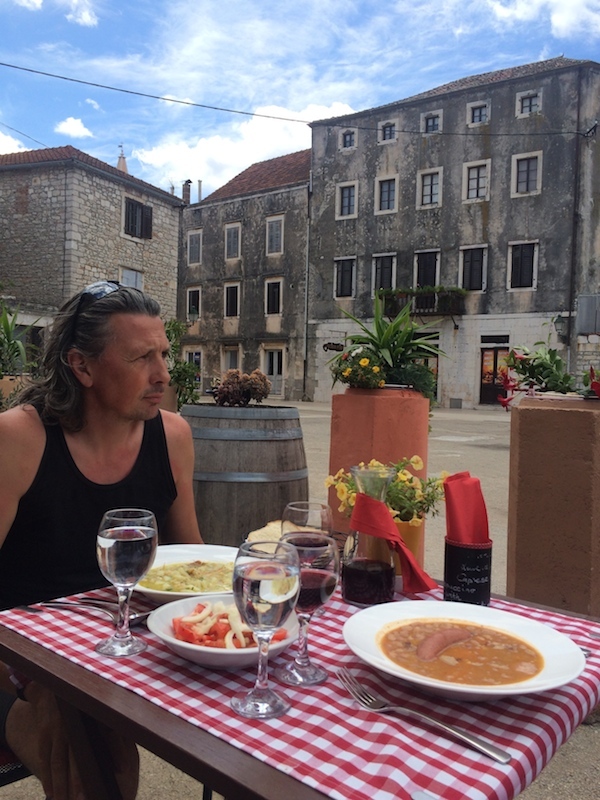 This phase of our travels in Croatia has shown us that you can find beauty everywhere even when your first impression may be ‘spoilt’. 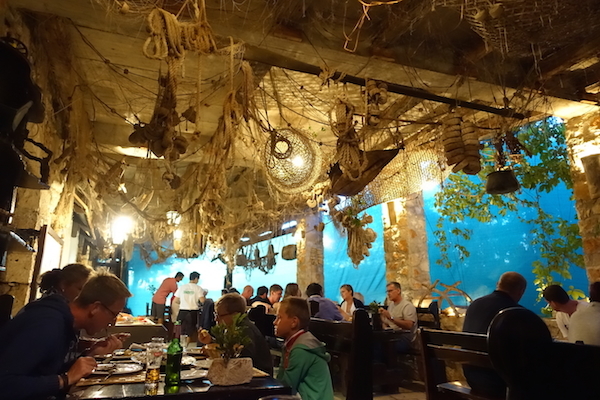 Did you know that Hravstka (Croatia) is where the English word ‘cravat’ comes from. We expect to see you properly attired in the next bulletin. You’re heading for Albania aren’t you? Or at the speed you are travelling you might have gone through it already. If not, did you know that there are ski resorts there? You could perhaps look around for a ski chalet to do up……….might be a bit different than France. And did you know there is a ski resort by the name of Puke? With a micro-brewery that produces Puke Beer?